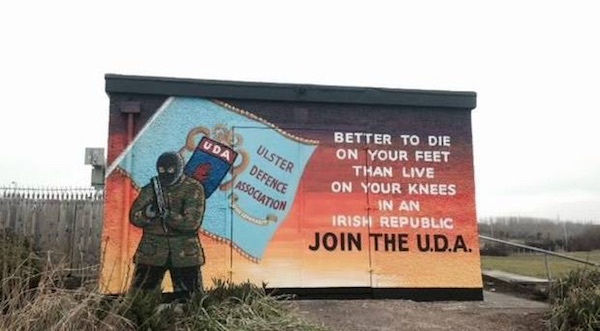 The South East Antrim UDA have been holding families to ransom, it has emerged, as the growing loyalist paramilitary group continues to flex its muscles. The organisation was responsible for an attack on a young family last week in which a baby narrowly escaped injury. On Wednesday and Thursday of last week, several houses and cars in Newtownards were attacked and bricks thrown through a front living window of a family home. In one of the incidents, large bricks were thrown through a front living window landing on their furniture narrowly missing the infant and other young children. It is understood the attacks and others are part of an attempt to extort money from a number of individuals and local businesses. The group has also been linked to the actions of gangs recruited by KBC bank to carry out violent evictions in the 26 Counties. The organisation is also reportedly expanding in north Down, with the ranks swelling with young criminals. It continues to feud with other loyalist groups, provoking a new arms race as they attempt to fight back. In 2017, the UDA carried out the killings of rival loyalists, former ‘commander’ Geordie Gilmore and his associate Colin Horner. Last month, two of their supporters, Tommy Morgan and Darren Bennett, were jailed for trying to buy weapons via the ‘dark web’. Alliance Party representative Stewart Dickson said there is a “fear” growing and around the Carrickfergus area, which has seen the worst of the feuding. “It has gone on for too long now,” he said. “They’ve brought a bad reputation and bad name to a town that simply doesn’t deserve it.